[184 Pages Report] The environmental testing market was valued at USD 8.47 Billion in 2016 and is projected to reach 12.75 Billion by 2022, at a CAGR of 7.1% during the forecast period. Increasing regulations pertaining to environment protection, cost- & time-effective customized testing services, and active participation of government and regulatory bodies to monitor environmental conditions are the factors driving this market. The key players identified through secondary sources include the Environmental Protection Agency (EPA), U.S. Department of Agriculture (USDA), Council on Environmental Quality (CEQ), and EUROPA. Their market share in respective regions has been determined through both, primary and secondary research. 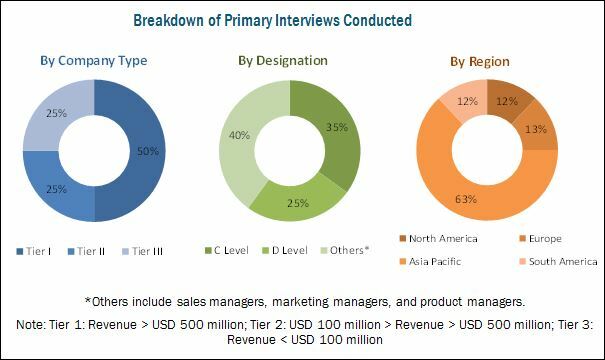 The research methodology includes the study of annual and financial reports of top market players, as well as interviews with industry experts (such as CEOs, VPs, directors, and marketing executives) for key insights (both quantitative and qualitative) for the environmental testing market. The various contributors involved in the value chain of the environmental testing market include raw material suppliers, R&D institutes, environmental testing service providing companies as SGS (Switzerland), Bureau Veritas (France), Intertek (UK), Eurofins (Luxembourg), environmental testing equipment manufacturing companies, and government bodies & regulatory associations such as the Environmental Protection Agency (EPA), and the Council on Environmental Quality (CEQ). This research report categorizes the environmental testing market based on sample, contaminant, technology, and region. The environment testing market is estimated to be valued at USD 9.03 Billion in 2017 and is projected to reach USD 12.75 Billion by 2022, at a CAGR of 7.1% from 2017. The market is driven by increasing regulations pertaining to environment protection, cost- & time-effective customized testing services, and active participation of government and regulatory bodies to monitor environmental conditions. The environment testing market, based on sample, has been segmented into wastewater/effluent, soil, water, and air. The wastewater/effluent segment dominated this market in 2016, due to growing environmental concern related to waste disposal & treatment and regulations on wastewater/effluent disposal. The water testing segment is projected to be fastest-growing during the forecast period due to the increase in health standards, demand for clean water, and shortage in water supply. The environment testing market, by contaminant, has been segmented into microbes, organic compounds, heavy metals, residues, and solids. The organic compounds segment dominated the market in 2016 and is projected to be the fastest growing by 2022. This is due to its high level of emissions and sustained growth in consumption, mainly of hydrocarbons. The environment testing market, by technology, has been segmented into conventional and rapid. The rapid technology segment dominated the market in 2016 and is projected to be the fastest growing by 2022. Low turnaround time, higher accuracy, sensitivity, and the ability to test a wide range of contaminants in comparison with conventional technology are the reasons for the growth of the rapid technology segment. North America accounted for the largest share in the environment testing market. Several environment-governing organizations are present in the market and have enforced various environment protection policies. The North American environmental testing market addresses various environmental issues such as climate change, acid rain reduction, and greenhouse gas emissions. Asia Pacific is projected to be the fastest-growing regional market during the forecast period is driven by infrastructure development such as construction and energy-related projects, growing awareness regarding environmental pollution, and sustainable transformation of environmental policies. High capital investment for accurate and sensitive analytical testing is the major restraint for this market. 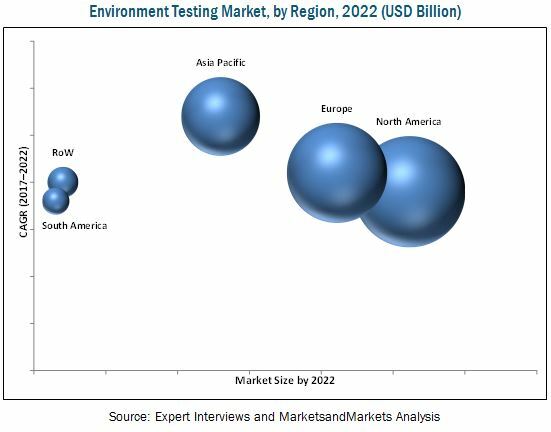 The global market for environment testing is dominated by large-scale players such as SGS (Switzerland), Eurofins (Luxembourg), Intertek (UK), Bureau Veritas (France), and ALS (Australia). Mérieux (US), Microbac Laboratories (US), R J Hill Laboratories (New Zealand), Symbio Laboratories (Australia), and Alex Stewart (UK) are a few other key market players that also have a significant share in the environment testing market. *Details on Business Overview, Services Offered, Recent Developments, SWOT Analysis, MnM View Might Not Be Captured in Case of Unlisted Companies.